There is no news from former partner Frank Jackson en his farm “Rubies Rest”. There is good news from the Aids orphanage “New Start Childrens Home” of Dr. Farag and his wife Grace in Harare. The Dutch Embassy has helped vigorously with the equipment of the laboratory and training of the staff. Dr Farag hopes the embassy will continue supporting in 2010. Mesics intends to have a mediating role in this process. 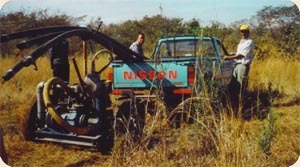 After many years working as mechanical engineer and sales manager for various companies in Harare, Jackson desired to create “Rubies Rest” and to engage into rural development. 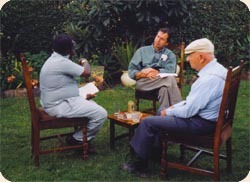 Jackson received in 1997 a concession of 12 acres from the local authorities of Dzwete, where he founded “Rubies Rest”, named after his late mother. Tilapia-culture being one of his targets, Jackson approached Fr Heine and Mesics early 1998. Originally “Rubies Rest” was Jackson’s answer to his rural ambitions in week-ends and holidays. In 1999, Jackson decided to move permanently to “Rubies Rest”. Together with Mesics, the purpose of “Rubies Rest” was redefined as a small scale model-farm for training, inspiration and social development. Essential criterion from the start has been financial self-reliance: running costs are to be covered by the proceeds of the daily operations. Major additional investments can be financed by outside sources. Investments by Mesics: 2 pick-up trucks, tractor, windmill, pump, grinding mill, 2 bore holes, 12 foot-container, various tools/facilities for production and storage. The impact of “Rubies Rest” has been considered by Mesics as meeting its purposes and its criterion of self-reliance up to 2004. Due to a combination of different circumstances, however, Mesics has decided early 2006 to suspend its cooperation with Frank Jackson for a period of 3 years. During the 3rd Conference of Mesics in Bénin it was decided not to renew the cooperation with Frank Jackson.